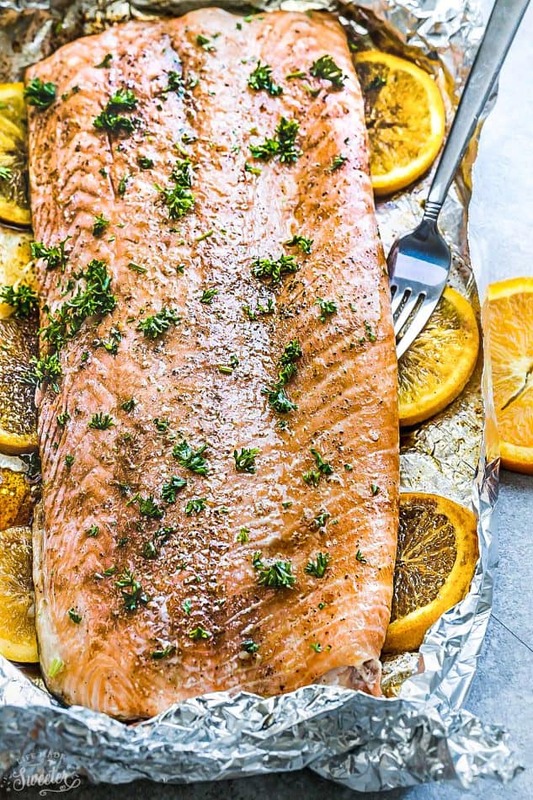 Baked Orange Sesame Salmon in Foil – is the perfect easy and healthy weeknight recipe. 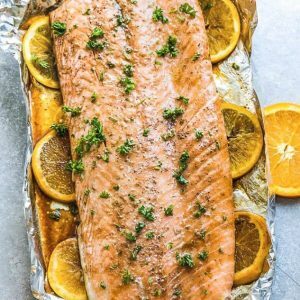 Best of all, the salmon is cooked to tender, flaky perfection in just 30 minutes with a flavorful orange sesame glaze. 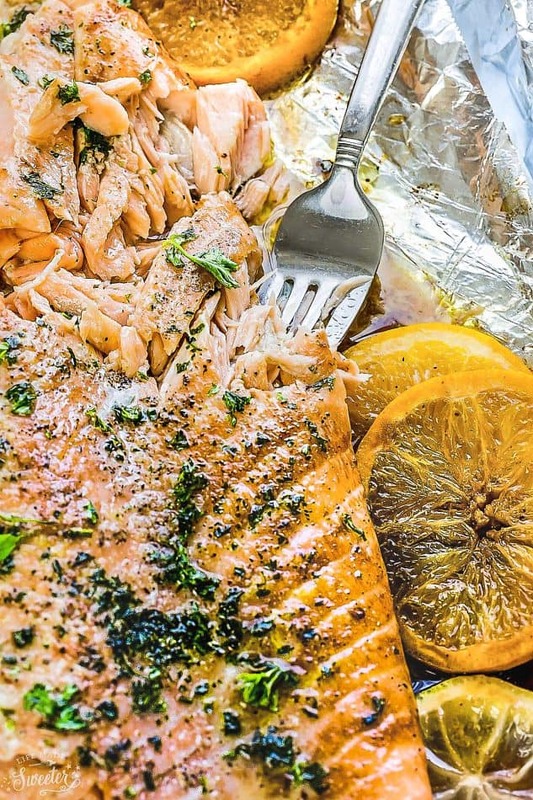 One of my favorite easy ways to cook salmon is wrapping it in foil and baking it in the oven. So simple as a recipe can be and less dishes is always a good thing. Plus it’s super tasty and the salmon cooks up to tender, flaky perfection. Tasty enough that even my son who is usually not a seafood lover asks for this instead of heading to his favorite restaurant. Luckily for him, I make salmon at least twice a week and it’s seriously the best for those crazy weeknights when you’re super tired from a busy day. Plus, you can practically customize it with whatever flavors you have and cleanup a breeze! Start off by whisking together the citrus-y sweet and salty glaze. It’s made with honey, soy sauce, rice vinegar, sesame oil, orange juice and some fresh ginger and garlic. Add a smidgen of Sriracha for a kick of spice or you’re free to totally leave that out. Next, you’re going to pour the delicious glaze over the salmon filet, wrap it up in foil and pop it in the oven! It bakes up perfectly fork tender and full of flavor! Serve along with some rice and your favorite veggies and dinner is set! 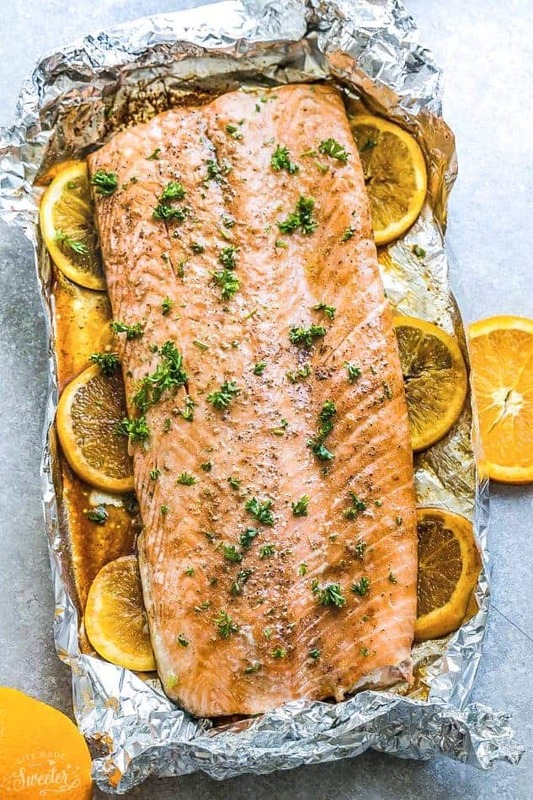 Baked Orange Sesame Salmon in Foil - is the perfect easy and healthy weeknight recipe. Best of all, the salmon is cooked to tender, flaky perfection in just 30 minutes with a flavorful orange sesame glaze. Preheat oven to 400 degrees F. Line a baking sheet with foil. In a small bowl, whisk together honey, soy sauce, orange juice, rice vinegar, sesame oil, ginger, garlic, Sriracha, and pepper, to taste. Bake for 15-20 minutes. Switch oven to broil and cook for another 5 minutes until salmon is slightly charred. Serve immediately and garnish with fresh cilantro and sesame seeds, if desired. 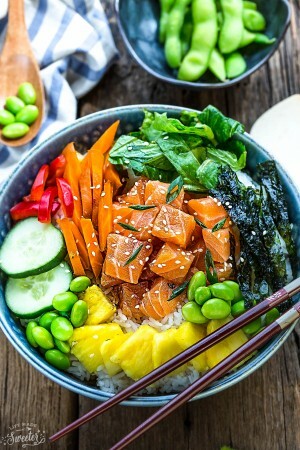 Salmon Poke Bowl + Giveaway!! Kelly, this salmon looks amazing!!! I love love love the flavor combo here!!! Happy Chinese New Year! we’re going to a friend’s house today to celebrate! What a yummy dish to celebrate Chinese New Year! I love the sesame seeds in this salmon dish to give it a great texture!! This salmon looks great, Kelly! I have to admit, I’ve never had success with baking salmon. I ALWAYS manage to overcook it! Need to try this next time! Such a delicious glaze for the salmon. Happy Chinese New Year, Kelly! Hope you have a wonderful time getting together with the family. Oh my 😀 That looks so delicious and juicy!! Love the colour of the glaze! o Kelly, I just love everything you cook…this is so delicious and moreish. Wow! This looks super tasty! Amazing receipe!! I am loving the combination of orange and sesame. I bet this would be really good with tofu too! I love a simple and easy cleanup dish like this. Happy New Year to you! We’ve been eating like there’s no tomorrow but this salmon makes a comforting dish after an endless feast. This salmon looks SO good, Kelly! My husband and I eat salmon at least once or twice a month, and I’m always looking for new ways to prepare it. This orange sesame version sounds perfect! And I love that you made it in foil too. Definitely trying this out! Happy Chinese New Year, Kelly! 新年快樂! Hope you start feeling better soon! I love recipes like this, a great midweek meal idea. Happy Chinese New Year, Kelly, and what a great way to celebrate! I make salmon weekly and I love the flavors going on here. The foil pouch is so nice for easy clean-up, too! Love this glaze, I’m sure it tastes delicious! Happy new year Kelly! I love how easy this is Kelly! Gong Xi Fa Chai!! Happy Chinese New Year Kelly. This orange salmon sounds so citrusy and fresh. Love how awesome this looks. And glaze is just fantastic. My husband and I were just talking about how we needed a new way to prepare salmon. Love these flavors! We’ll be trying this soon! Happy New Year, Kelly! Salmon is on our menu tomorrow—yours looks fabulous!!! Kelly, I’m loving this salmon! Great use of the seasonal oranges! I am just looking for a salmon recipe for next week. This would be perfect! Happy New Year! Wish you and your family good health and happiness! Yum this looks delicious! We’ve been doing salmon Sunday so I’ll have to try this recipe next! This glaze sounds delicious. 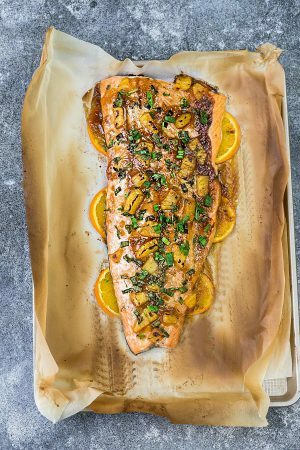 I love a good sweet and sticky citrus salmon!